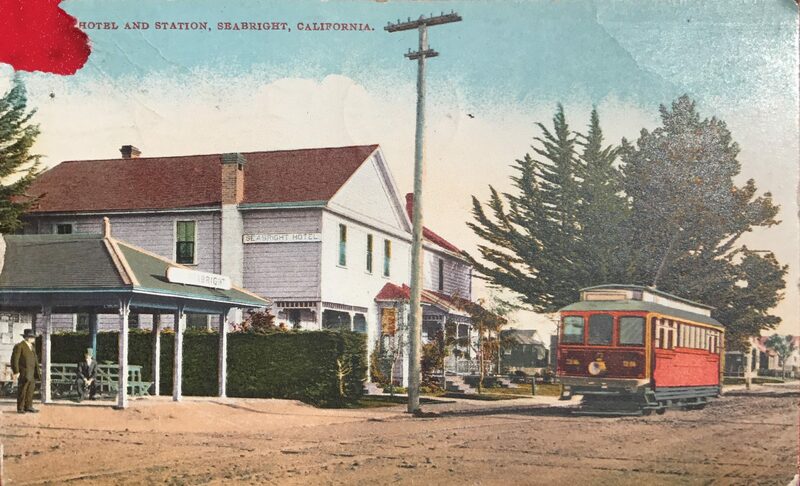 The front of this card shows a trolley pulling up to the Seabright Hotel and Station. The Seabright Station was used and advertised as an Aquatic Getaway to folks in San Francisco and San Jose, mostly between the 1890’s and 1910’s. Really, not an uncommon story in the history of Santa Cruz’s neighborhoods. It’s nice to head out on a birthday adventure and vacation, just as long as your guests don’t eat your peaches. 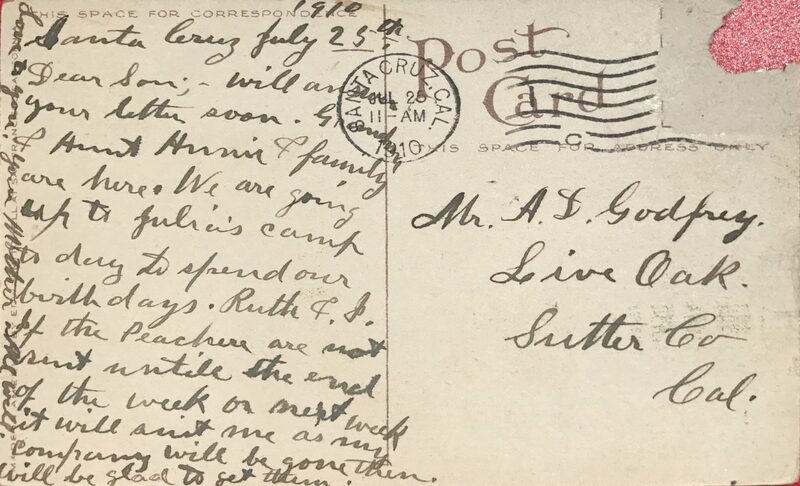 Dear son;- will answer your letter soon. Grandma and Aunt Annie & family are here. We are going up(?) to Julia’s camp to day to spend our birthdays. Ruth & I. If the Peaches(?) are not sent until the end of the week or next week it will suit me as my company will be gone then. Will be glad to get them. Love to you. Your Mother All Well. 2 Responses to All Aboard the Seabright Trolley! Thanks for the nifty post card about the Seabright tram. I enjoyed the train link you included, too. Bonus feature. It was nice seeing you the other night at the Arts Council’s Beer Fest. Keep it flowing! Hey Isaiah, Thanks for the comment, It was good to see you too!